Lithium-ion battery back-up power system outperforms lead-acid battery back-up systems in reliability, thanks to a new “internet of things” battery management system. 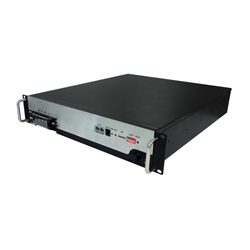 This system also lowers back-up power system TCO by 40% or more because of its compact, space-saving design. Back-up power must always be online, ready to keep critical operations up-and-running during a power failure. Lithium Power ESS-500-48 offers greater reliability, longer lifespan, and much lower TCO compared to lead-acid battery systems. Lithium Power announces a more cost-effective, space-saving solution for emergency back-up power installations, based on lithium-ion batteries fully integrated into a Battery Management System (BMS). The BMS monitors battery health and status, communicating with technicians and engineers over the internet. This internet-of-things approach significantly upgrades the ability of utilities, hospitals, production facilities, server farms and other operations to obtain a cost-effective but highly reliable back-up power source, ready to go when their main electricity source fails. Many of these enterprises currently rely on lead-acid battery systems to provide emergency back-up power. The technology is stable, well-known and reliable. But, these installations have relatively short five-year lifespans, have to be visually inspected constantly, and take up a lot of space. Lithium-ion batteries take up much less space and last longer, but have earned a reputation for overheating, as evidenced by recent hoverboard product problems. This is the biggest issue that needed to be resolved before lithium-ion batteries could replace lead-acid batteries as the best emergency power option. A properly designed BMS combined with the battery set solves the problem. It leverages the benefits of internet connectivity to allow technicians and engineers to monitor battery sets and their environment (including temperature) remotely. The system also automatically takes action to keep temperature under control, reducing risk and wear-and-tear. The BMS also extends the life of a lithium-ion battery emergency back-up system to ten years, double the lifespan of lead-acid systems. Lithium Power has created a lithium battery energy storage system, the ESS-500-48, which incorporates a new BMS. This proprietary BMS uses an internet-based reporting system that allows engineers to remotely monitor the back-up power system after installation, even using their smartphones. A lithium-ion system beats lead-acid alternatives on TCO because lead-acid battery installations are large, heavy units that need a lot of durable floor space to comply with construction and maintenance regulations. Lithium battery units are far lighter and take up over 80% less space. Said another way, a lithium battery-based system delivers the same back-up power using 20% or less of the floor space of a lead-acid battery installation. Lithium Power found that in a recent installation in a large university hospital [http://www.lithiumpowerinc.com/pdf/ess-500-case-study.pdf , the average cost per watt/hour of available power (TCO) for the Lithium Power ESS-500-48 has been $1.74, where the TCO for a comparable lead-acid battery pack installation would have been $2.90. This is a reduction of 40% in TCO, while still increasing reliability and ease of management. In higher-rent buildings, where space is at much more of a premium, the impact of the rental or lease savings on back-up battery power TCO becomes even more significant. Lithium Power, Inc. has been specializing in lithium battery technology since 2004. It offers custom-made battery packs as turnkey solutions for OEM/ODM customers for medical, UAV, AGV, LED light tower, solar-powered street light and surveillance cameras, and other energy storage and industrial applications. The company also provides reliable, long-lasting off-the-shelf lithium replacement batteries for consumer products like the iRobot Roomba®, Scooba® 300/450 series, Neato® XV series consumer vacuums, as well as scalable lithium battery modules for home-based solar-powered products. Lithium Power, Inc. offers innovative breakthrough technology and ideas tailored to each of its specific application markets. For more information, call (408) 837-0206 or visit us at http://www.lithiumpower.com.